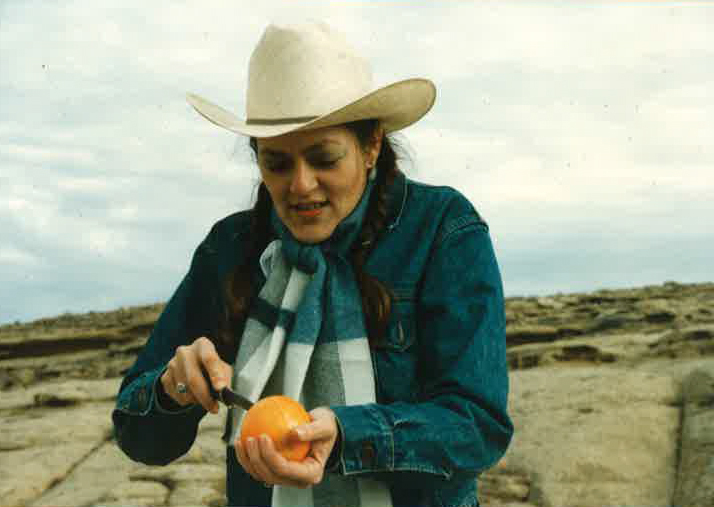 Originally from Virginia, Charlotte Hadella received a Ph.D. in American Literature from the University of New Mexico and joined the faculty of Southern Oregon University in 1991. She served as SOU site Director of the Oregon Writing Project and (twice) as Department Chair and training and mentoring many area teachers and university colleagues. Among her publications are Of Mice and Men: A Kinship of Powerlessness (Twayne, 1995) and, with Michael Baughman, Warm Springs Millennium: Voices from the Reservation (University of Texas Press, 2010). In spring of 2016, she was one of the three faculty members receiving the University’s first ever Distinguished Teaching Award. In December of 2016, she retired from teaching at SOU, offering courses on social justice in antebellum US literature and on teaching literature for the last time. EB: Do you remember what you taught in your first year at SOU? CH: WR 121 and 122; Intro to Native American Literature; ENG 488/588 Teaching Literature; Graduate Education courses in language arts pedagogy, and supervising student teachers in Middle School and High School English placements. EB: What else stands out from that year? CH: I was able to convince the administration to allow me to establish a National Writing Project site here. I submitted a grant to NWP, was granted funding, and began my 20 years of work as the SOU Site Director for the Oregon Writing Project. EB: How has your teaching evolved over the years? CH: My preparation and planning for courses gained focus and clarity over the years, and my instructional goals and implementation became more streamlined. I believe I would describe my teaching philosophy as “less is more.” My emphasis is on depth rather than breadth in terms of engaging students and pushing them to become independent, self-motivated learners. EB: You pioneered scholarly research on women characters in Steinbeck’s fiction. Tell us a bit about that work? CH: Well, I never thought of my Steinbeck research and publications as “pioneering.” I think I just entered the conversation in the mid-1980s at a lucky moment for women scholars who were writing about Steinbeck. People like Mimi Gladstein had offered commentary on Steinbeck’s women characters, and a number of male scholars had published extensively on all of Steinbeck’s work, but I decided to steadily beat away at the notion that, although Steinbeck created unflattering and often un-empowered female characters, he was writing from an ethnographic stance. He was highlighting the paucity of choices for women’s lives in America. He was motivated by empathy rather than misogyny. I suppose that angle seemed “fresh” at the time, so I had success publishing articles on Steinbeck’s short fiction, and some articles and a book on Of Mice and Men. EB: Is there anything you still wish you could teach? Or teach again? CH: Trick question: I really feel that after 45 years as a classroom English teacher, I don’t wish to teach in an academic setting again. I’m retiring from that while I still enjoy it. What I fantasize about is teaching my grandchildren how to plant gardens and pull weeds! EB: What were some high points of your work at SOU? CH: I really appreciate that I’ve had an opportunity to work in a variety of arenas at SOU. Each area of focus was a high point for me at the time I was involved in it. Certainly the Oregon Writing Project work and teacher preparation courses dominated my career here for almost two decades. I believe that the work we do at SOU to deliver professional development training in teaching writing addresses an important element of our university’s mission: serving the community. I loved working with area public school teachers and I admire tremendously their work ethic, enthusiasm for teaching, and respect for the needs of their students. I was thrilled when we were able to hire Margaret Perrow to take over the Writing Project work so that I could move into teaching more courses in American Literature. Interestingly, the “high points” of my teaching career came in the courses that were the most challenging for me to create: Social Justice in Antebellum US Literature, and The Beat Moment—US Literature in the 1950s and ‘60s. Every time I taught one of those courses, I learned something new about the topic, and I was always pleased with students’ responses to material that I think most of them would have never read had they not taken my classes. And, of course, working with great colleagues in the English Program and across campus has been the highlight of my experiences here as a professor. I have also enjoyed working with a number of great students over the years. EB: Any other thoughts you’d like to share about the academic life? CH: Academic life, though it may look leisurely to those people looking in on it from outside, is not for the “faint of heart” (I believe that’s the expression). Teaching demands constant attention to details, to student needs, to program needs, to a variety of professional demands. I never felt that I was done with my work, even during lengthy breaks (winter and summer). I created lesson plans in my sleep. Just last week, I dreamed that I was told I couldn’t retire because I hadn’t passed chemistry yet! I’ve sort of been possessed by teaching for the last 45 years. EB: What are your plans, post-SOU? CH: I will finally have time to practice the piano again. I’m excited about doing all the prep work in my garden that needs to be done in winter and spring so that my summer garden is spectacular. Paul and I will be able to make short camping trips to the coast whenever we please, and to visit our daughter in Corvallis more often. Also, I haven’t seen my family in VA for over four years, so I plan to travel there this spring. Eventually I plan to edit a young adult novel that my daughter, Lucia, wrote in her early teens. That will be more fun than work. If I do any writing myself, I think I’ll write a memoir that focuses on our house, since we’ve remodeled that little cottage from the inside out, several times over in the last 25 years. We call it a recycled house. It’s grown and changed as we have grown and changed as a family. EB: Thanks for talking with me. We’ll miss having you on campus!